Not sure how to add weight lifting into your routine? Try a Les Mills BODYPUMP class. While Les Mills BODYPUMP is intended to build strength and sculpt your muscles, it’s also a killer cardio workout, with many tracks spiking your heart rate and leaving you dripping with sweat. Each song track focuses on a different muscle group, with a warm-up and cool-down track opening and closing the class, and requires various weights (heavier for the bigger muscle groups, lighter for the smaller ones). You’ll do a high number of repetitions with lighter weights for maximum fatigue and, ultimately, to get stronger. The class is one hour long, suitable for all fitness levels and ideal for those who want to add weight lifting into their routine. This hour-long weight lifting class takes place in a group fitness studio with an instructor at the front of the class demonstrating movements and form, while performing the reps with you, all choreographed to high-energy (often popular) music tracks. Bring water, and arrive early, because this class requires a bit of set up. (Insider’s tip: This class is very popular. So, during high-traffic times, such as Saturday mornings, arrive up to 30 minutes before class starts to get a good spot.) 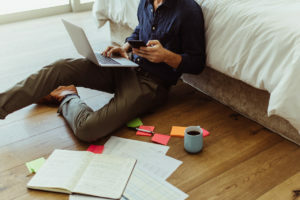 Many instructors will encourage you to stay through the first four tracks, then come back next time and add on a track, and so on and so forth until you can stay through the entire class—but this is up to your discretion. Set your bench on the risers, and set up your bar with “warm-up weight” for the first song, a warm-up track. This will be the lightest bar of the class (usually between 5 and 10 pounds on each side). Lay your additional weights on the ground next to your bench and place your mat on top of your bench. Make sure you leave enough room for anyone in front of you to move back (for lunges, for example). You’re all set! Each class consists of 10 musical tracks: a warm-up track, leg track (the heaviest weighted track of the class), chest track, back track (second heaviest), and triceps, biceps, lunges, shoulders, core and cool-down tracks. The instructor will lead you through each track, demonstrating the movements and calling out time cues and various moves. Between each song, there will be a chance to change the weight on your bar, and the instructor will clue you in as to what weight you should load or unload based on the muscle group. Unless otherwise instructed, you will use the bar for every track except core and cool-down, and occasionally you will need hand weights (the instructor will let you know when to get them). The movements comprising the class include, but are not limited to: squats, squat pulses, dead lifts, dead rows, clean and press, power press, push press, chest press, regular and tricep push-ups, tricep kickbacks, tricep dips, plated overhead tricep extension, bicep rows, bicep curls, lunges, shoulder press, rotator raise with overhead extension, crunches and leg lifts. 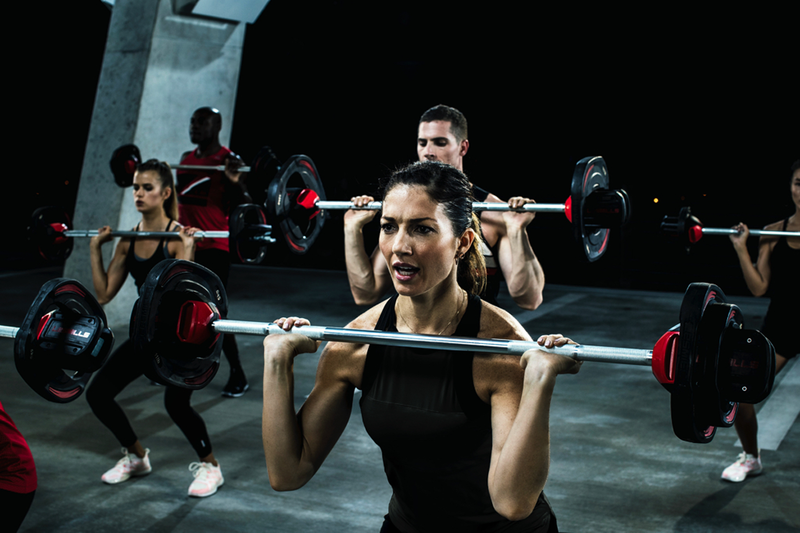 BODYPUMP has a bit of a cult following, with die-hard pumpers coming to class anywhere from three to four times per week. But beginners are always welcome—even if you’ve never lifted a barbell before. The greatest thing about a BODYPUMP class is that you can modify it to meet you where you are at. Need to go lighter on a certain track? Take some weight off. Ready to squat a little heavier the next class? Add a 2.5 on each side! People of all shapes and sizes take BODYPUMP because it’s a great cardio and strength workout—and it’s never boring. Suggested attire: Form-fitting, comfortable clothing you can squat and lift in.